The underground parking garage that has inverted U-shaped racks to accommodate about 20 bikes. A prison bar-style outdoor bike rack that is mostly covered (depending on what direction the wind blows), and can theoretically fit 50 bikes, but from my point of view is basically worthless for those of us that use fenders and a U-lock with the exception of the end spaces. During the winter months, I have made regular use of the garage. It reduces the time I need to spend in the cold locking and unlocking my bike and it keeps my bike decently warm so my hands do not immediately turn to ice when I put them on the handlebars. However, I will still occasionally park outside and lock to what I consider the substandard prison bar-style rack. Through commuting regularly to my job in this shared parking environment, I have begun to notice funny things about us bike commuters. The early bird gets the primo parking. The earlier I can get to work, the more choices I have about where to park. The closer to nine a.m., and the worse the selection becomes. This encourages me to get out the door with enough time to stake my claim at one of the indoor U-shaped racks. If I have to park outside on the prison bar-style rack, I only want to use an end space. As I wrote previously, I have a tough time swallowing parking that requires me to lift my bike up and over a bike rack. It Is a pain to park with fenders installed and I am certain that I am scratching the BEEP out of the underside of my downtube when I do it. Instead of having to deal with launching the front of the bike over the rack, I make an effort to get to the office early enough to score U-shaped rack or at least an end space on the outdoor bar-style rack. Through this shared parking experience, I’ve realized that I am not possessive about one particular spot. Rather, I like to have types of parking from which to choose. I want to be able to park at any of the U-shaped racks that are available or, if none are available, I want one of the end spots on the bar-style rack outside the building. OK, I concede that I am possessive about those end spaces! Other than that, I do not care. However, there are some people who DO care. They have specific spots where they want to be. I’m not sure how they feel if someone inadvertently takes their spot, but I imagine they do experience a little disappointment. Why? Who knows. Like I said, we commuters can be funny. Some people like to leave their locks at the office. Many of the spaces indoors have multiple locks on them. I don’t know if this is somehow related to people having “their spot” and this is one of the ways they mark it, or if it is because people don’t like to carry their locks on their bikes. I tend to think the latter. As a person who uses my bike not only to get to work but to run errands after work, I do not leave my lock at the office. I never know when I will need it. This apparently is not be the case for other commuters, whose path must be directly from home to work and back again. 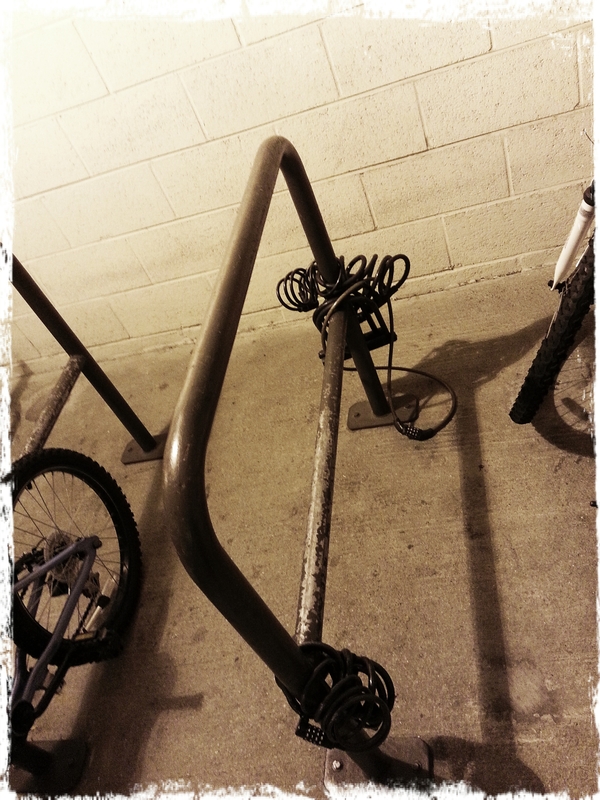 These locks can junk up the racks a little, but not so much that it makes parking an issue. 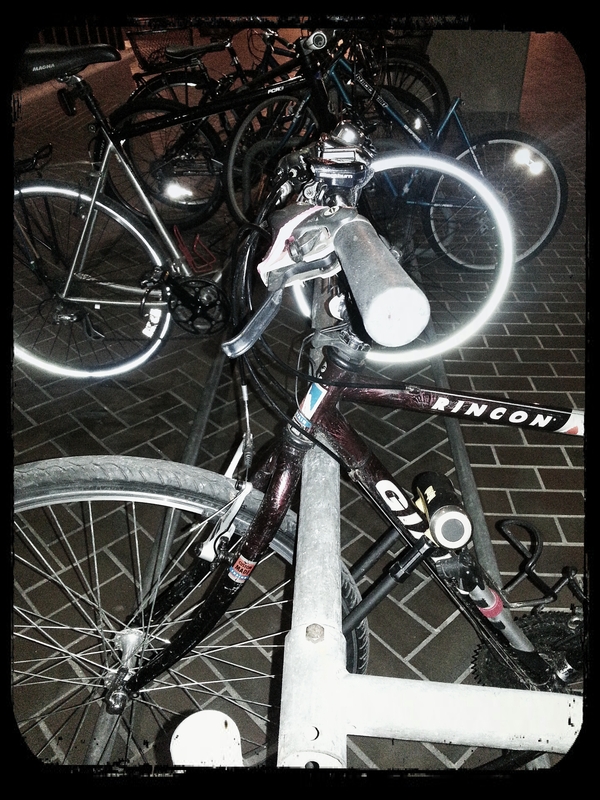 Some people think it’s fine to leave their bikes in long-term parking at the office. I could not imagine leaving my bike at the office for anything more than the occasional overnight due to extreme weather or other unexpected circumstances. However, there are some commuters who do not think like that, and are completely ok with leaving their bikes at the office for several days, if not longer. There is also one individual who uses his bike exclusively for sport. He or she does not commute on the bike, but rather, leaves the bike at work (in one of the primo indoor parking spots) to ride either over lunch or after work or I don’t know when. I find this situation peculiar because it conflicts with what I believe the purpose of the bike racks to be, which is to provide a space for people who are using their bikes for tranportation to and from the office. At the same time, it’s great that the person is riding their bike to exercise. I think if we had the luxury of more indoor parking I would not notice this bike or care as much. However, we don’t. Some people don’t care as much as I do about where they park their bikes. 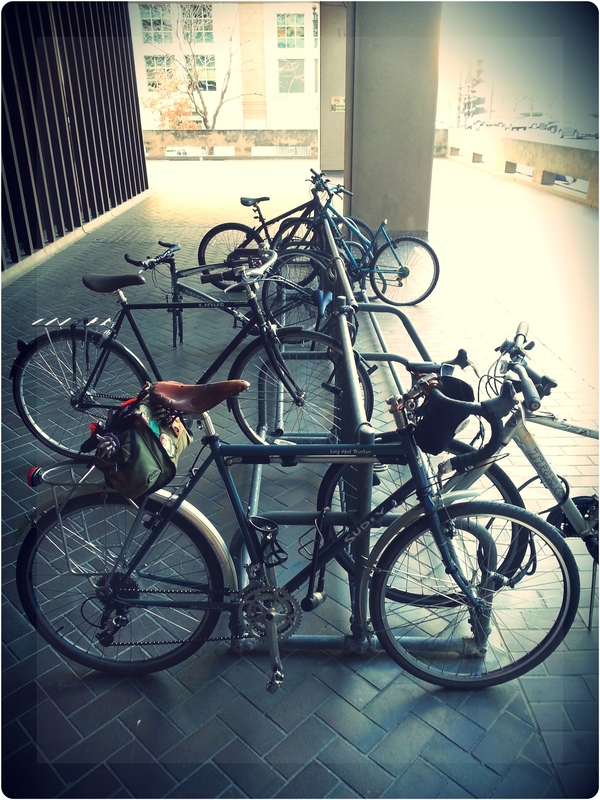 At least three or four commuters consistently park their steeds in the prison bar-style rack. Even when there is an end space available on these racks, they have no qualms hefting their bikes and locking them up in the middle of the rack. I also notice that these riders do not have fenders on their bikes. Part of me envies their carefree ways, but mostly, I think we should get a better rack for outside our building. I compare my bike to other bikes. If you read this blog at all, you know that my Surly Long Haul Trucker is my primary commuter and I’m quite proud of it. I like how it looks, it rides well, and I’m please with how I have accessorized it. Whenever I park my bike, I check out the other bikes around me to see what people are riding: road bikes with no fenders (what?! ); Linus bikes; hybrids; mountain bikes; and many others. I look at the lights, racks, and other accessories people choose to adorn their bikes and light up their rides. On rare occasions I spy a person with tastes I admire. I’ve even seen someone in our garage who rides a Surly and uses a Carradice (like me!). Unfortunately, we are not on the same work schedule so I can only imagine what he or she must be like in real life. Checking out how other people choose to bike to work is fun. I am sensitive about people parking next to me. Due to our limited spaces, parking will be tight. Even so, it’s taking me time to adjust to sharing space at the bike racks. I attribute this to being from Iowa, where I grew up accustomed to a lot of personal space. My lack of comfort about the proximity of other bikes to mine is strange because when I’m outside running errands, I don’t care nearly as much. I park wherever I can, and if others park next to me, I just don’t want them to accidentally lock their bike to mine. I’m trying my best to transfer this mentality to my daily parking at the office, but it’s taking time. Bike parking is an area of improvement for many businesses. In my case, we do alright, but I wish we had space for 20 more bikes in the underground parking garage. I think that would allow all those who bike commute to park inside if they choose and I would not care so much about a person (or two) who leaves his or her bike at the office for midday or post-work sport riding. Man, I did not realize all the stuff I was missing when I could park my bike in my office with me. Parking in shared space has given me much more food for thought. What about you? How does your bike parking situation compare and what things have you noticed? Pitter Patter: Cold Winter Days in D.C.
Great that there are enough bike commuters to make the habits and etiquette of shared parking an issue worth noting. 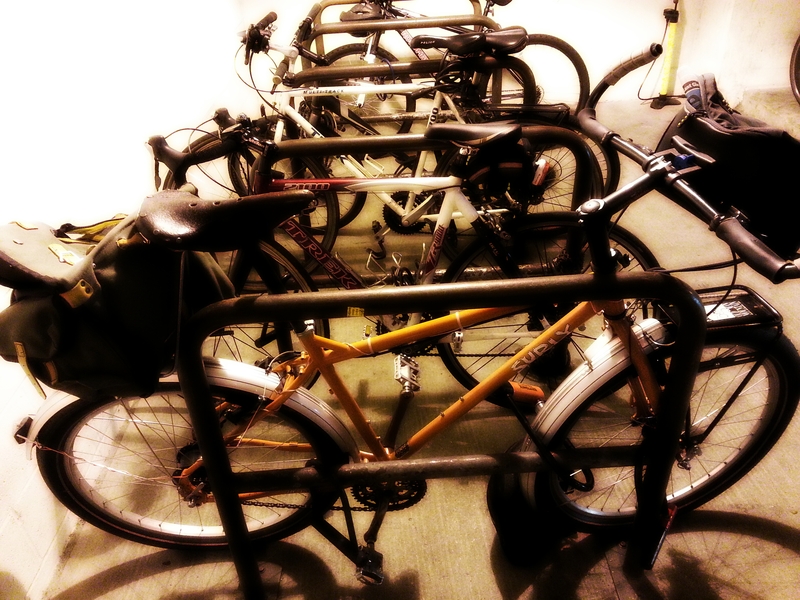 I still enjoy my in-office parking so I have no experience with sharing a crowded rack. Interesting observations. First… jealous! Second… I agree, there is really no established etiquette about bike parking, except for our own notions of how it all should work. I wrecked my front fender on a prison cell rack at my old office. One day the police (my agency had its own police force) would not let me lock it on the top of the rack. I stopped riding to work. Then I found out they had the same kinds of rack in the garage next to the security guard station. Good deal. The rack was crowded mostly with noon time fitness bikers. At one point the parking office tried to evict them but cooler heads prevailed. I am all for people going for a ride at lunch time. In fact, a few of them were so unpleasantto work with that I often hoped they’d keep riding. My pet peeve is the mountain bike riders who jam their bikes into the rack and damage the tape on my handlebars. My new office is in an old building and has barely adequate bike parking. It had never been too full which is odd because most of the riders are commuters from my floor. My workplace has no bike parking- I have to fight for “primo” covered parking with cars. A bike rack is under consideration by mgt- what is the “best” type of rack? Make sure it’s not a “prison cell” or “wheelbender” rack with a continuous top bar and a lot of little intermediate vertical rods. They make “wave” racks which are OK, and “staple” racks which are even better. Basically you want racks which aren’t connected across the top, and which allow two points of locking (front and rear wheels). Yes, staple racks (those are the ones I have been calling “inverted Us”) are really great for bikes. We have a bike room at work in the garage. In order to gain access via your access card, you sign an agreement that the room is for daily parking and not storage. Yet people keep storing bikes and locks there. I find it really aggravating as a daily commuter that takes everything with me at the end of the day. I can see leaving your bike overnight occasionally due to fail weather or unexpected happy hours. 10+ months is completely unreasonable. I’m completely spoiled, and park my bike just outside my cubicle in a corner. My boss is supportive, although occasionally bldg management give me the stink-eye. It would be much harder to ride in every day if I didn’t have such a nice parking arrangement. I would probably find a nearby garage and park it there so it could be covered. Of course then I’d have to negotiate just the kind of politics which you mention. That is awesome that your boss supports your commuting and parking your bike near your office. Not having to worry about locking up your bike and where is a nice benefit. We have ample inverted-u racks around the perimeters of the buildings. I do notice the same bikes parked, and I can’t tell whether they’ve been there overnight or whether the owners like to park in the same spots. I like to mix it up. I get in fairly early, so I rarely have to worry about finding a space. I do have the option to park in the garage, but I have to register my bike with my workplace, and I believe they charge a fee. My bike is not precious enough to warrant this, so I’m fine with parking outside for free. That is interesting that they charge a fee. I’m not that familiar with places charging for bike parking. I’ve always had this mentality that we should not have to pay to park. Maybe that’s misplaced? My current bike parking situation is the worst of all three places I have worked at. Sort-of covered staple racks that are too close together and always full. Best was at my desk; next best was first-come first- served fully enclosed lockers. Locks left on overnight were cut off. That job had a shower room with lockers by the door. You would think the extremely massive components manufacturer I am contracting at would do something better. Oh no, that is terrible. It makes me crazy when the parking is inadequate and when people install racks in such a way that they are difficult to use and/or impossible to use fully. People think a LOT about car parking. I hope we get to a place where we plan better for bike parking. There are some spots at the rack at my office which are better than others because they are in plain view of the security desk, while others are blocked. Occasionally the rack gets very full, but usually has lots of empty spaces earlier in the morning. And the best facilities I’ve ever used are the bike lockers in downtown Phoenix near the central transit hub. If I ever build an office complex for my own company, it will be furnished with plenty of bike lockers for bicycle commuters. I don’t know much about bike lockers, though I know a few metro stations have them. Why do you think that bike lockers would be better at work? Because of what Michal mentions below? Security: you only need to carry a secure padlock for the locker. And no worries about components being removed from your bike, either, or vandalism. Non-damage: you don’t have to worry about others denting scratching or otherwise abusing your bike through normal rack usage/abusage. Ride a better bike! Weather: keeps the rain, snow, and sun off your bike, leather seat, and tires. I’m really lucky: Although bikes are not permitted in my building, we have a set of individual bike lockers just outside, and I rent one for $75/year. Bike theft is a big problem in Eugene OR. The locker not only keeps my bike dry, but lets me bring an expensive bike if I want to ride recreationally after work, and without worrying about various detachable components. Those who don’t have lockers have staple-style racks, some covered and some not. As I said in the previous comment, I don’t know much about lockers. I’m curious as to how these lockers are more secure? Are they near impossible to break into, or? Yeah, I’m like you. I don’t know about using a cable lock for running quick errands in D.C. I mean, it might be fine, but if at all possible I’m using my u-lock. I’m already riding a heavy steel touring bike. I don’t care about a weight penalty. I noticed the same bike permanently parked in one of the few bike racks near where I used to park to regularly run errands. I verified that it was permanently parked, not just re-parked in the same spot every day by changing the position of something on the bike, and noting that the something remained in the same position day after day. I bought a cable cutter (the lock was a cheap cable type) and cut the cable. The bike stayed where it was (it was in pretty rotten shape) for another week or two before it finally disappeared. Maybe some of the bikes you see are abandoned. A regularly scheduled house cleaning, sponsored by authorities, would help. I understand WABA did one of these at some stations recently. That’s a good question. I think it’s more that I can’t live with a bike without fenders, and those slot or bar-style racks are nearly impossible to use with them. ALTHOUGH I did get some good feedback from Felkerino about the possibility of using locking skewers, which might then make the bar-style rack more useful. That stinks! I hope you are able to either: get some decent parking at MINIMUM or find a job you like AND that has a decent bike commute setup. Another reason (beside the Store) you should have never left us! We miss you. Right?! I miss both the parking AND the store! We only have one little rack at the far end of an underground car park where I work, which isn’t a problem at the moment seeing as there are only about three or four regular cyclists. It’s one of those ones where you’re just meant to slot your wheel in (I don’t know what they’re called) – clearly a design from the days when bike theft wasn’t such a problem, as you can only really lock the wheel to the stand and nothing else. I’m pretty confident the car park is secure during the daytime, but I’ll never leave my bike there overnight. I think that is a smart move. I would really not like to leave my bike overnight in a public garage. Oh, I mentioned in a previous comment that my husband suggested using locking skewers on the wheels to make your bike less vulnerable to theft. I’m lucky. I’m the only one in the women’s locker room so I lock my bike to my locker, inside, protected all day while I’m out in the field. We have wave racks, and plenty of room in the garage, right at the bottom of the entrance ramp. They’ve recently fenced the whole area in, but it’s not locked, so I’m not sure what that was intended to accomplish. We realized a couple of years ago that bike thieves used our garage to stash stolen bikes for awhile until the hunt had died down. We reported it to the police but they were very confused about it not being our bikes and didn’t follow up. We have a lot of bike racks outside (mostly for the students — I used to park the Tank out there because I didn’t care that the kids would play with my shifters) and and a bunch in the secure underground parking where I now park. The racks are joined at the top, which I can never use because of the front basket. However, we don’t have so many bicycle commuters that I have to fight for the end. They are right next to the entrance as well, so that’s nice. We had the problem of people leaving their bikes not just for days at a time, but as many people noted for months at a time. Don’t people at least want their bicycles on the weekends? To solve that, our building management actually instituted a bicycle registration system. I think if you bike in and home regularly and don’t get it registered, you’d probably be fine. But for the folks who leave them all of the time (many of whose bikes had seen much better days), it gave the management an excuse to remove them.